I am a traveler; however, I am also a business owner. I make pits stops in various countries to work on my two huge Travel Sites. 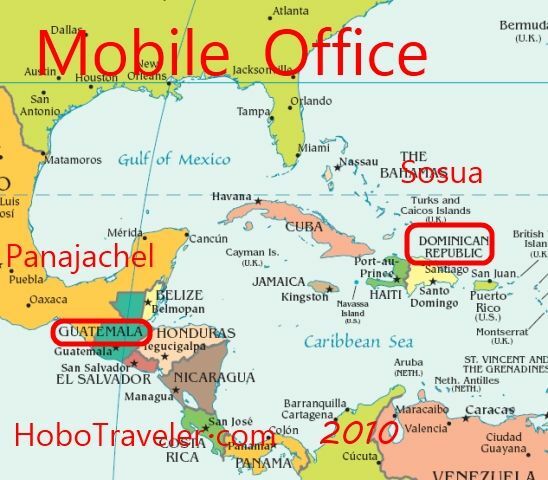 I am happy to say, Sosua, Dominican Republic is being added to my preferred cities on Planet Earth whereby I can have a mobile office. I will add this to my Mobile Office Page. This page is always a work in process, and one day I hope to make it into a full-fledge section of the site, whereby we assign or make this directory the playground for a PHP Coder. 1. Rent an Apartment for one month for 250-600 USD. 2. Internet fast enough to use Skype.com or VOIP. 3. Tourist Nest is good. 4. Backpack Internet Access in many restaurants for me or you when the regular stupid things happen. 5. English Conversation for your sanity. 1. The router needs rebooted and the owner is gone. 2. The electrify goes off, and owner does not have generator backup. 3. The owner does not pay the Internet Access bill. There is almost a direct correlation between location where there are many boom boom girls or bars and great internet access. Please folks, and dreamers, engage your brain, YES, I can find great internet access easy if I go pay 50-300 dollars per night and stay in a Five Star Business Hotel anywhere on the planet. However, to find possible where the Hotel cost is less than 20 USD is difficult, however getting easier to find all the time. There is hope; Dominican Republic is only one hour ahead of New York City. When it is 8 AM in New York, it is 9 AM here. I can make phone calls over Skype, this is truly difficult to arrange when I am in Thailand or the Philippines and there is a 12-hour difference. Now, if the people here in Sosua were a little more friendly, cuddly and warm, life would be more perfect, life is always good, but some days great. I use my Verizon Smartphone to write these posts while I am searching for the mobile office locations now, the Smartphone is a windfall for me.